The Quaker records as abstracted in William Wade Hinshaw's Encyclopedia of American Quaker Genealogy, Vol I for North Carolina, listed 8 children for Abigail and Nathaniel: Sarah, Elizabeth, Aaron, Jane, Joshua, Hannah Lydia and William, born between 1706 an 1724. 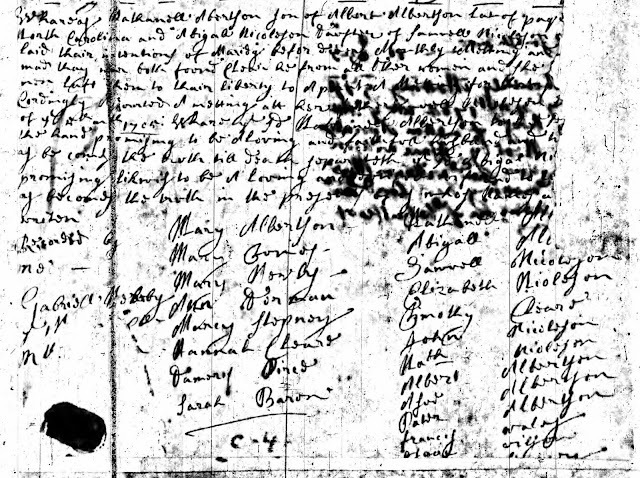 Bjorkman's book of Quaker Marriage Certificates showed Abigail Albertson (with various spellings) as a witness for the marriage of 3 of her sisters: Jane in 1712, Elizabeth in 1719 and Hannah in 1721. She was also a witness for her daughter Elizabeth's marriage in 1725. Abigail was not listed in her father's will from 22 Mar 1727/28, so it is likely she died before that date and after 1725 when she was a witness for her daughter's marriage. 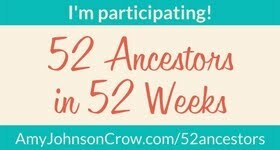 Someone has posted an entry on Find A Grave for her, listing her death date as 1727.